It’s hard to believe that the runDisney Twilight Zone Tower of Terror 10 Miler (#Tower10Miler) was over a month ago! This was the second time I’ve been lucky enough to run this one, and it stands as the only runDisney event I’ve ever repeated. In fact, other than this, there are only 2 local 5ks I’ve repeated. I guess I’m not really one to repeat races, but my experience in 2012 with the #Tower10Miler was so bad it almost made me stop running. I needed redemption. Did I find it? Hmmmmm, I’m not too sure, but I did have a much better experience so there’s that. My issues with this race in 2012 were partly runDisney’s fault and partly not. The expo was awesome and more than exceeded my expectations! It was a great first impression as this was my first runDisney event. The event staging area and event transportation were also huge hits! The corrals were much more organized and closer to the drop-off than I thought they would be. There were even port-a-potties in each corral, which was awesome. However, it was all downhill from there. The heat and humidity really got to me and made for a miserable night. Also, I felt the entertainment and course theming were lacking, even for a newbie like me. Fast forward to 2013, and from reports I read and heard, course theming and entertainment had really been stepped up. When registration opened for 2014, the event date coincided with an already-planned family vacation so adding this on to the beginning seemed like a good idea. I went into this event ridiculously under trained. I considered bailing at least a hundred times. I just couldn’t let it go, though, and I’m so glad I didn’t. I didn’t arrive until Saturday morning, so the expo had already been open for a day when I got there. The expo was practically empty when I got there Saturday morning. I did arrive shortly after it opened on Saturday, which was right after the Happy Haunted 5k. I enjoyed seeing all those runners with their cute Hitchhiking Ghosts medallions and all the cute costumes. The kids races were about to get underway, too, so there was a lot of hustle, bustle, and excitement in the air, perfect for setting the stage. The expo, on the other hand, was completely empty. This worked to my benefit because my first order of business was getting the special runDisney New Balance shoes. I wanted both the Minnie and the Cinderella ones and anticipated long lines. However, I walked right up and 5 minutes later had my shoes in hand! Next up was merchandise. My only complaint about the event is that they were out of almost all merchandise. I only got an “I Did It!” t-shirt, and had to settle for men’s at that. I don’t understand why they can’t get the merchandise right. They either have way too much and lots ends up in the outlets weeks later or they run out very early, and late-comers don’t get anything. I’ve even heard reports of things being sold out at the expo, only to show up in the outlets weeks later. What’s up with that? I digress. My next stop was the KT booth for the special Minnie KT tape. I’m a sucker for all the things I can only get at a runDisney expo. I needed tape anyway, so what of it? Next I stopped at the Florida Hospital booth to pick up my free draw string bag. Have I mentioned I love bags? I do. All types of drink ware and bags are totally my thing! My dad came to the expo on a later bus than I did, so next I met up with him, picked up my bib, had a cute runDisney Instagram photo taken, picked up my shirt, and started to make our way back to the buses. 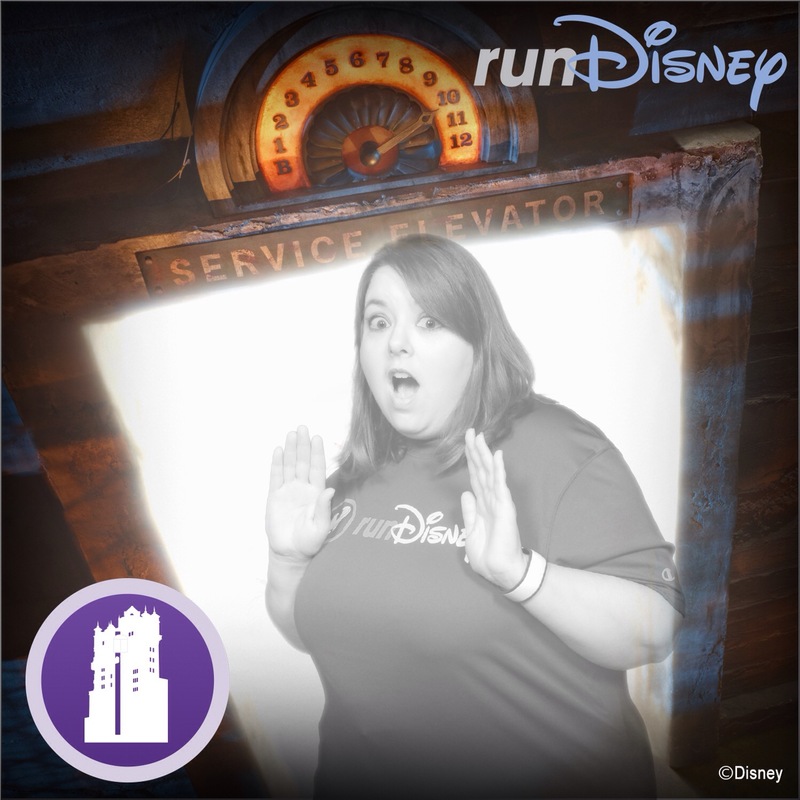 I love that runDisney offers these special photo ops for free. You just have to show them you follow runDisney on Instagram. On the way back, I noticed the beer carts were selling beer in cute runDisney cups. I didn’t want beer at 9 am on the morning of a long race so I stopped to see if they would sell me just the cup (hello, drink ware!). They did, and $4 later we were on our way back to the buses for real this time. Stay tuned for Part 2, where I’ll share my experience with the race itself. 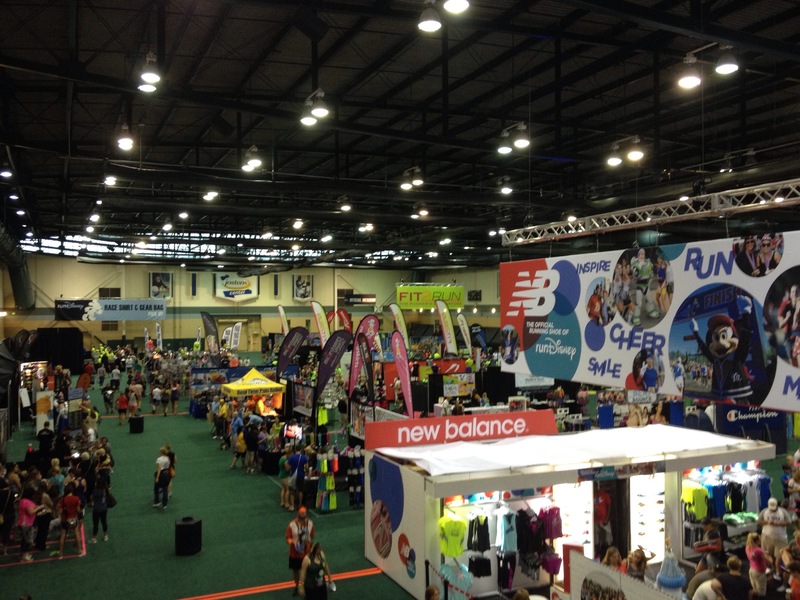 Have you ever seen an almost-empty runDisney expo?